Agility is a dog sport in which a handler directs an off-leash dog through a unique obstacle course in a predetermined sequence within the 'Standard Course Time' (SCT) . The rules are simple - handlers may give an unlimited number of commands or signals to their dogs, but may not touch either the equipment or the dog. Dogs are 'faulted' for actions such as taking down a jump bar, failing to put one or more feet in contact zone when on a piece of equipment, taking obstacles out of sequence, and running past or stopping before the next obstacle to be performed. Time penalties are also assessed against dogs that exceed the SCT. 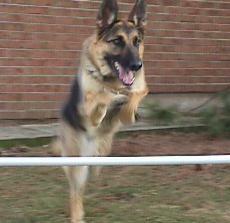 Dogs compete only against dogs of similar height at the withers within a number of jump height divisions. The dog with the lowest number of faults and the fastest time wins the class or height division.